The new puzzle that Juno is making now is a secret puzzle box. 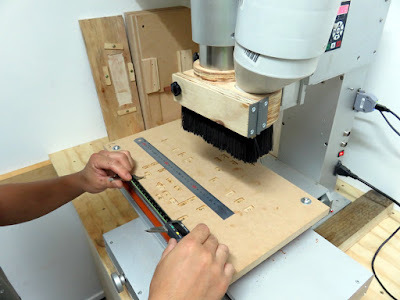 Since he has started making the secret puzzle boxes, he has been using the CNC router with high frequency. 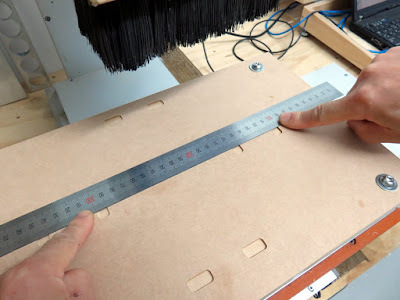 Then he noticed that the CNC router didn't make accurate cuts as he expected. 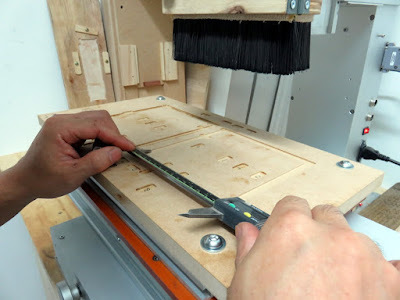 Making puzzles, as for the machine, high precision is required. The miniature furniture that I (Yukari) have made didn't need such high accuracy, even if the shapes were slightly out, they could be used for display for a dollhouse but puzzles need accuracy. The CNC router that Juno uses is a cheap Chinese product which has been on the market widely, and he has to obey the rules of "you get what you pay for." Occurring small issues were expected and he has solved some problems already. One of the issues that he solved was the wrong wiring of the stepper motor driver board and he had to swap terminals to the right position. Another issue was also the inappropriate position of safety limiter switches. 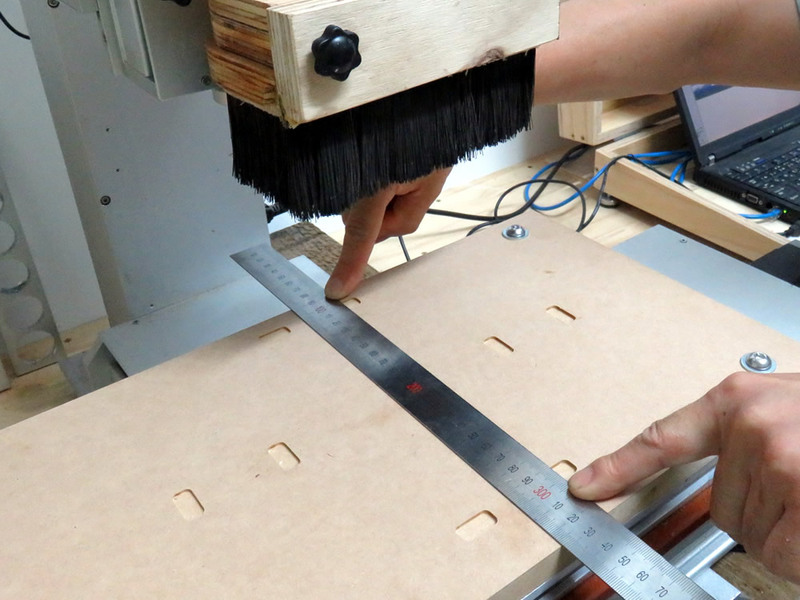 There is a question for you, can your CNC router cut a perfect circle? 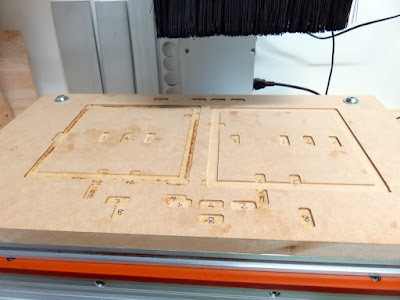 The CNC router is a machine that is controlled by a computer, therefore we tend to think that a CNC router can be perfect. However, it's not perfect if it's not set and adjusted correctly. Even though you had intended to cut a circle, it might be an ellipse. To begin with adjusting the CNC router, Juno milled out two grooves of rectangles 20mm x 10mm. 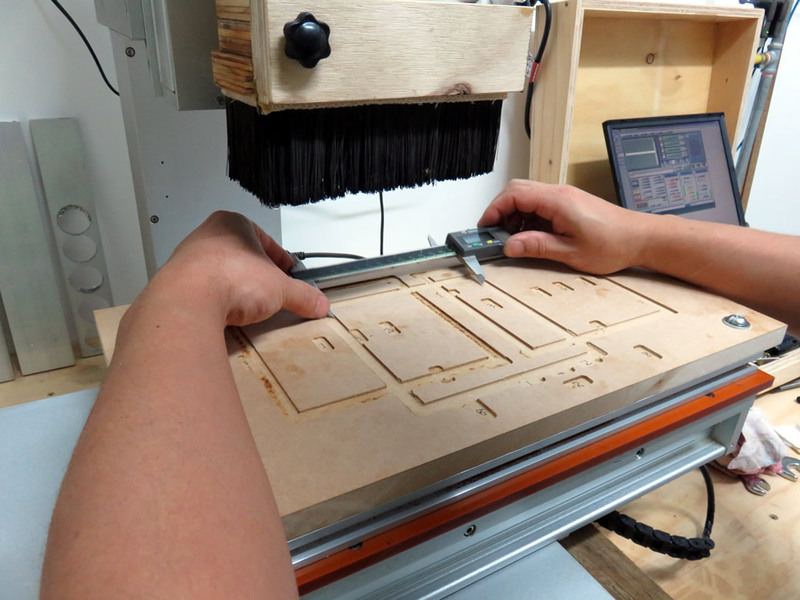 On the computer screen of CAM software, he drew two 20mm x 10mm rectangles at intervals of 200mm and processed it with the CNC router. He repeated the same procedure for X axis and Y axis, then compared two of them. When comparing two rectangles, it is important to check the length of two sides, inside and outside of the rectangles. If the length of X axis and Y axis don't match, you need to adjust the computer software and try it again. Juno tested it again and again and noticed that every time he did it the results were slightly inconsistent. In this case, it can be ascertained that there was backlash of the machine that led to the inaccuracy. 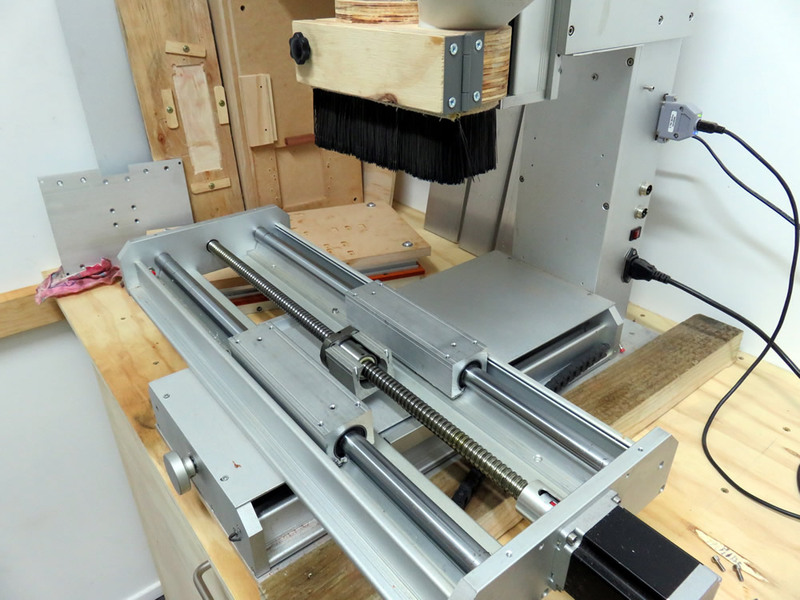 Juno inspected each moving part of the CNC router. What he found was the linear slider unit which was connected with a ball screw was not secure. Having a backlash of the liner slider, the work table of the CNC router was also not stable and X axis travel became shorter than he expected. 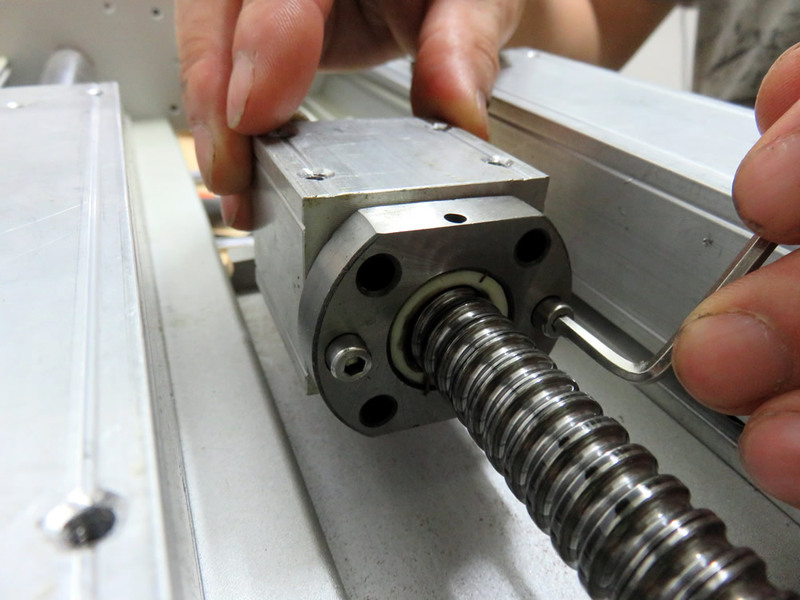 He checked several parts and found that the screws which fixed the linear slider and the aluminium block were loose. When he bought the CNC router, he had checked and tightened some of the screws, in addition, he adjusted some parts to be placed at right-angles but the linear slider unit was not checked because of the difficulty of access. He re-tightened the screws, fixed the sealed cap which had come off, and re-fixed the work table, then the backlash issue has gone! 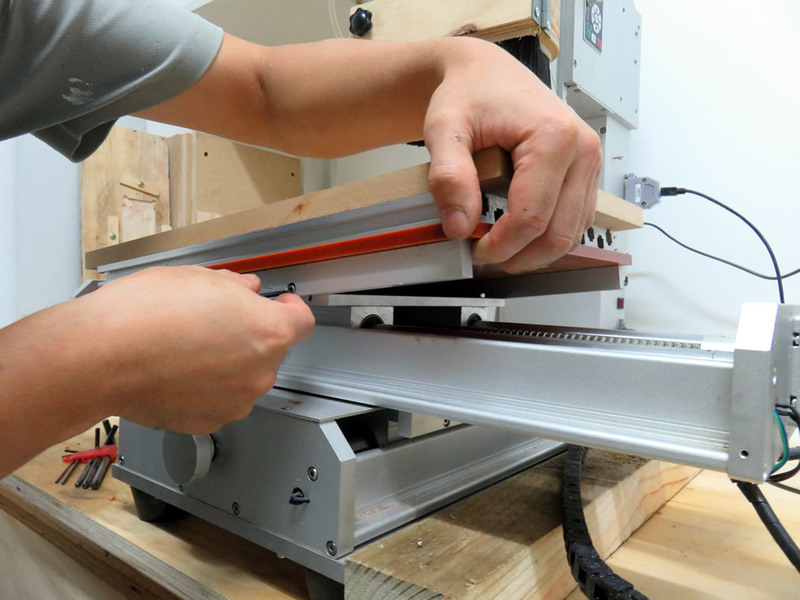 After finishing the inspection work, he milled a square shaped groove. As shown in the picture below is the comparison of before re-screwing and after re-screwing. Take a look at the square on the left hand side, as you can see the bottom of the groove is burnt because of the backlash. He examined the length of the squares' grooves and compared the length of X axis and Y axis, whose lengths were slightly different. The difference of 150mm square was about 0.1mm. The square supposed to be 150mm x 150mm became 150mm x 149.9mm. 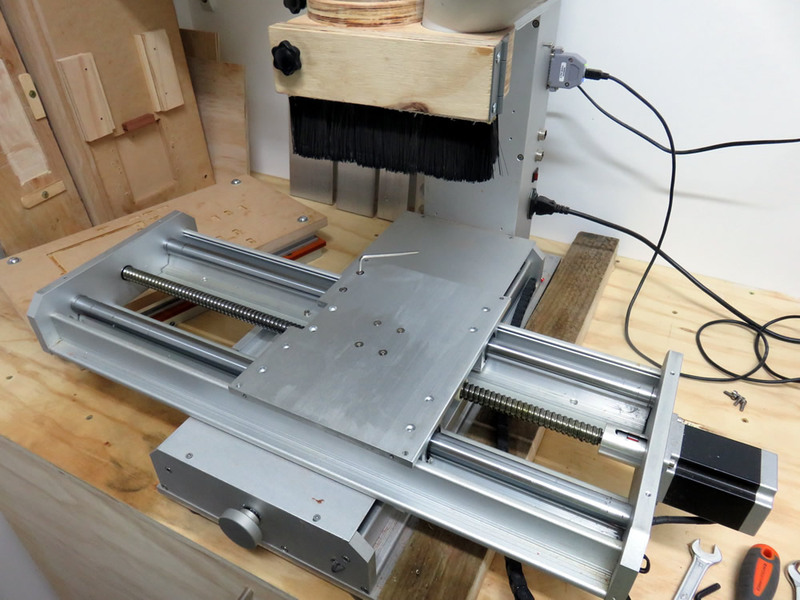 It means the spindle motor of the CNC router moved only 149.9mm along the Y axis, 0.1mm shorter than the expected measurement. So the travel of the Y axis has to be adjusted. The finer tuning of 0.1mm can be done by CNC software. 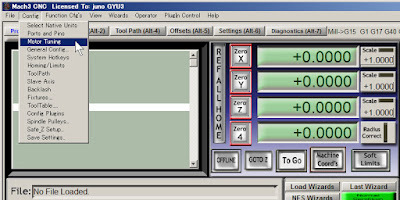 The CNC software we use is Mach3 which is very popular and common. 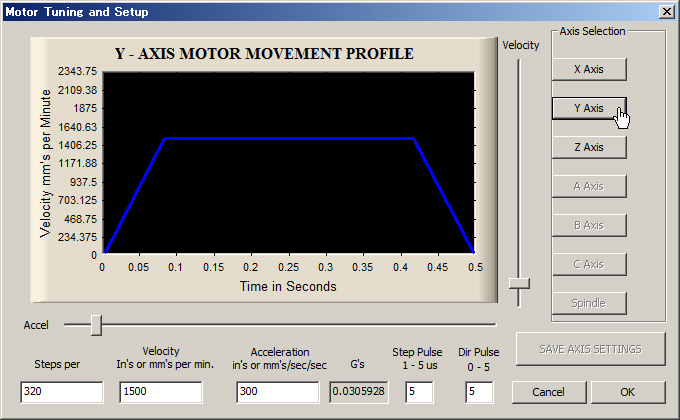 Under the "Config" menu, select "Motor Tuning" and then click the "Y Axis" button on the right hand side. 320 x 150 / 149.9 = 320.21347565043362241494329553035. He entered the calculated value to "Steps per" and clicked the "SAVE AXIS SETTINGS" button. 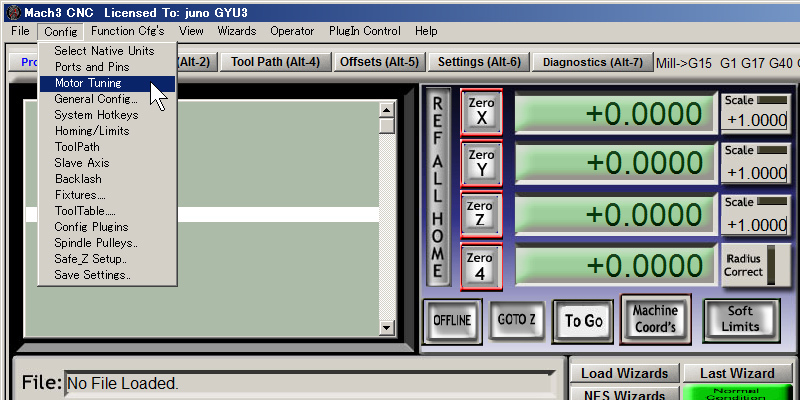 He clicked "OK" and closed the dialog and then chose the "Config" menu and selected "Save Settings." Just to make sure, it's good to double check the value of "Config - Motor - Tuning" settings because we often forget to press the "SAVE AXIS SETTINGS" button. After he finished the above mentioned adjustment he milled a square shaped groove again. It's important to measure both axis and sides: inside of X axis, outside of X axis, inside of Y axis, and outside of Y axis. 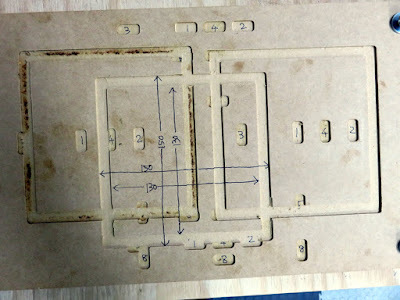 The picture as shown below is the MDF sacrifice board that was dismantled from the work table. The outside lengths of the square were 150mm, and the inside lengths were 130mm. The difference of the outside and inside measurement was just 20mm; Juno has finally got a satisfying result. 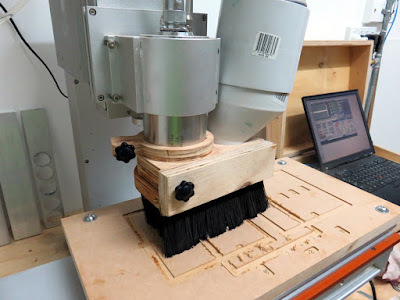 If you have got a result, for example 150mm and 130mm for X axis, 150mm and 130.5mm for Y axis, the discrepancy might be caused by backlash of the CNC router. In this case, a pocket can be milled accurately but the outside milling would be inaccurate. What if the measurement of X and Y axis are both 149.9mm and 131.1mm? Various factors can be imagined, but it might be not so serious as having a discrepancy to X and Y axis. * The diameter of the milling bit is smaller than expected or worn off. * The milling bit is extended too much and it causes it to bend. * Too fast feed rate or too much milling depth. Well, today's blog became long but we hope that if you find your CNC router inaccurate, our blog would be helpful.